You may have noticed there’s been an increasing amount of lag time on posts in SE Asia. Or maybe not, I’m not sure if you wait with bated breath for our emails. Regardless, we’ve been busy…laying on beaches. Which is a perfectly legitimate excuse to slack off. 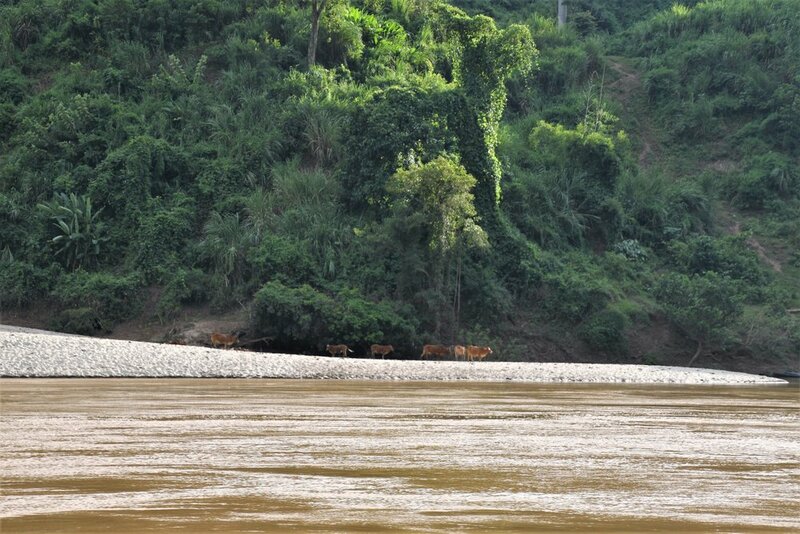 The mighty Mekong River. I usually don’t write specifically about our transportation adventures as those are on hold for a later post (or wildly best selling travel memoir). However, this little 3-day, 2-night excursion was by far the most interesting one we’ve had yet. The journey is not for the faint of heart, but if you can handle it, you’ll be treated to some amazing sites. We haven’t found anything else like it. To begin, we did research from other blogs & sites about what we were getting ourselves into (it certainly paid off, but more on that below). But when all was said & done, we just paid some money to our hostel in Chiang Mai & we were set. No company name, no contact information, just a pick up time. Perhaps that should have seemed sketchy, but by now we don’t really ask many questions. - Let it be known that you are not on a boat at all your first day. 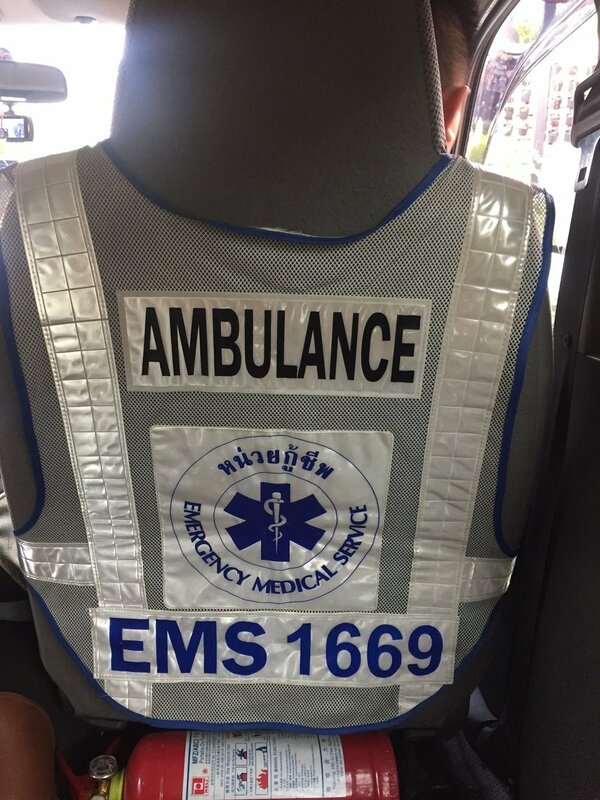 We were actually picked up in a strange van that is decorated like an ambulance & our driver was wearing an EMT shirt. Eventually we decided they must provide general transport to the hospital for those in the area. Lord knows there was not a speck of life saving equipment in it. - We were in said strange van for approximately 7 hours, inclusive of a few rather pointless stops. The first is for lunch, which I guess isn’t pointless, at a random roadside restaurant, which subsequently also has a yellow pool. Yellow is a terrible color for a pool. 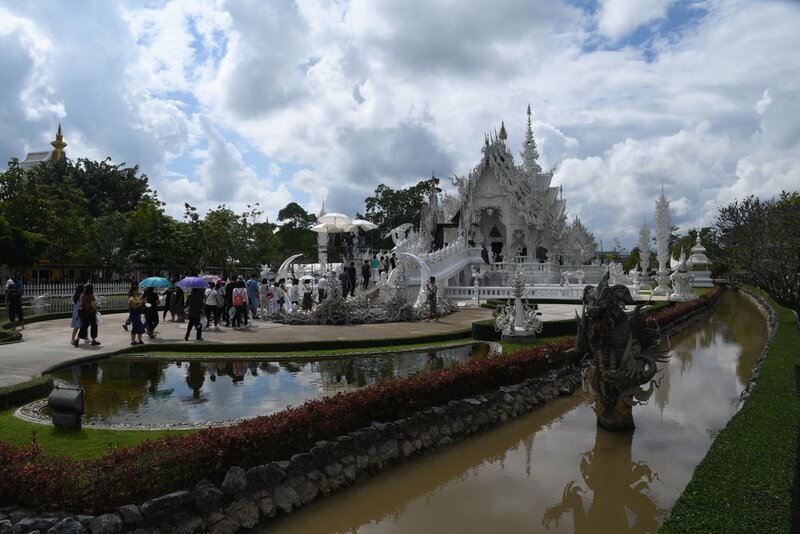 - Our second stop was in Chiang Rai at the White Temple. While the temple is pretty, it’s surrounded by very odd things such as red skulls on traffic cones, hanging shrunken heads & the “Predator” crawling up from the ground. Very strange. We did not waste the money to go in. - Finally, we reached Chiang Khong, a small border town along the Mekong. No idea what the industry is here, it may only exist because it is a border town, but there seemed to be something going on. - This may have been our worst accommodation to date. When we had paid, it included not only all the transport, but lodging on night one. The place was rough; room smelled wet/moldy, the bed was like a stone slab & a ceiling fan came crashing down on the floor in the dining room while we waited for dinner. Yikes. - Yay, we survived night 1! Barely. You are probably thinking ok so NOW you got on the boat. Not quite. - After a lackluster breakfast of some strange scrambled egg sandwich, we began the checkout process lead by the only guy who had so far given us any overall direction to our 20-25 person group. - The guy spent the next 30 minutes trying to convince us the Laos ATM’s were overpriced & it is easier to exchange money with him before crossing the border. He ran a pretty solid scam, skimming a good 10% off every transaction. Pro-tip: If the word “scam” wasn’t good enough - do not do this before you cross into Laos. The Laos ATM’s DO NOT take $10/ transaction from you & he gives you a terrible exchange rate to change money. Just wait. the only good thing about our accommodations - the view. 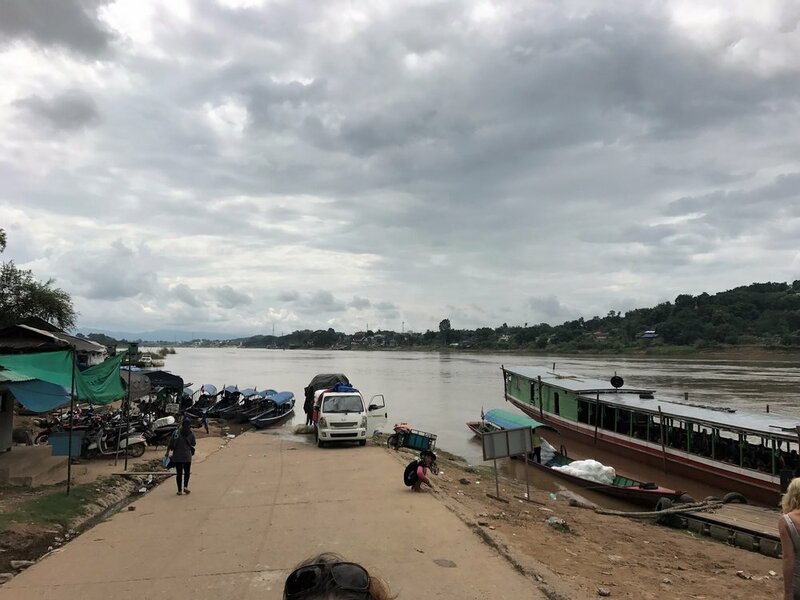 - From here, it is another van ride to the border, where you are dropped off to exit Thailand, take another 5 minute bus (that you pay for) across “no mans land” to the Laos border. Drop a few more American $$$ for your visa & you are finally in Laos. Still asking, so when do we get on a boat? 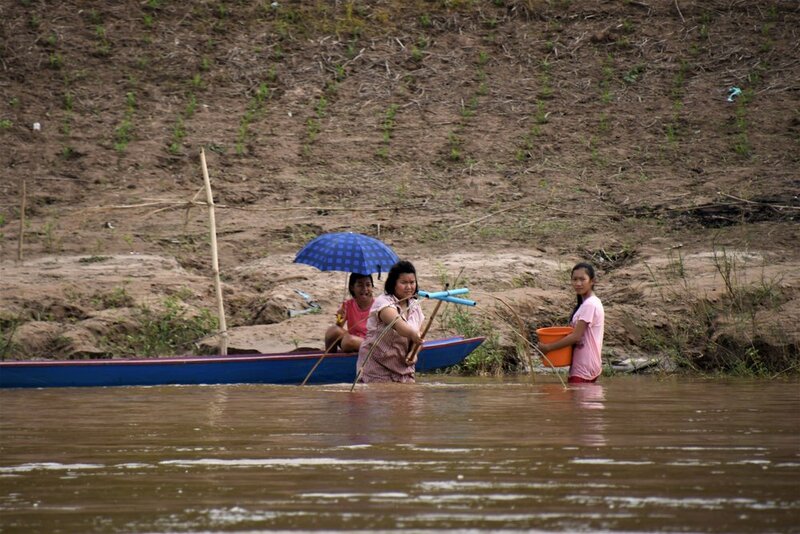 - Fast forward about 20 minutes in the back of a pickup truck taxi, we are deposited on the riverside at a small shack & spy a giant longboat quickly filling up with other tourists & locals for the day’s journey. Pro-tip: Invest in the throw-away cooler & fill it with beer (or water if you are more adult than us) from the shop. Oh, snacks as well, food is a good decision for the next 6 hour ride. 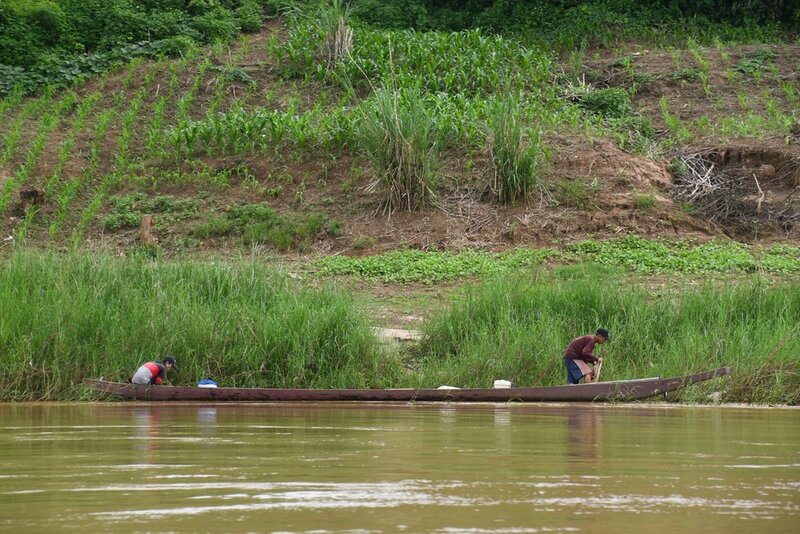 - Finally, after nearly a day & a half, we step onto this “slow boat”; a 100 ft. long, shallow, narrow, floating longboat. The seats were hysterical. They were old van seats (yes like cars) simply bolted down to the floor. Always reuse & recycle. - For the next 6 hours, you have little to do but watch the world go by & enjoy your beverages. You very literally slow floating down the river, past towns & villages always decreasing in size as you go further into the country. Every so often, you come across a beautiful temple tucked up in the mountains off the bank. - It was amazing and only us for the most part, making our slow winding progress downriver. Occasionally, a long cigarette-style fast boat would wiz past us, its occupants snuggled down with full motorcycle helmets on. I can’t say what speed they were doing but they were moving. Nothing looked safe or secure about this type of transportation. 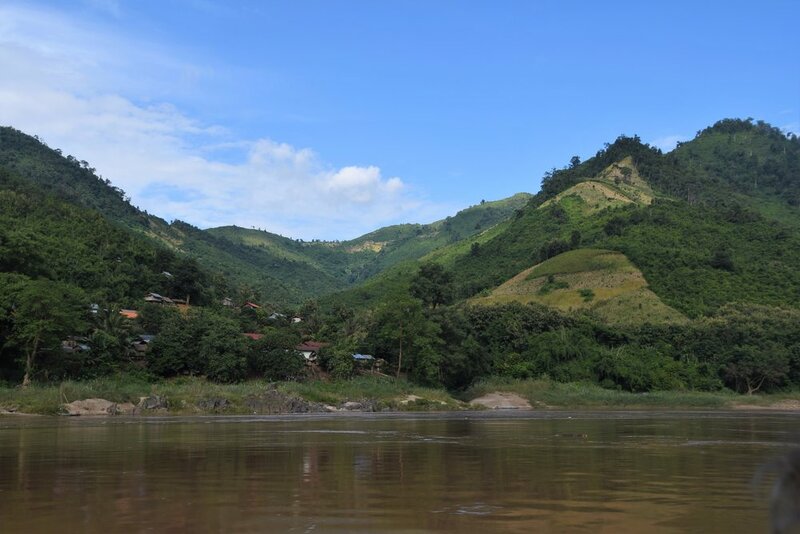 - Hours later, fresh out of beer, the engine’s constant hum ringing in our ears, we pulled into our destination for the evening - Pakbeng, Laos. 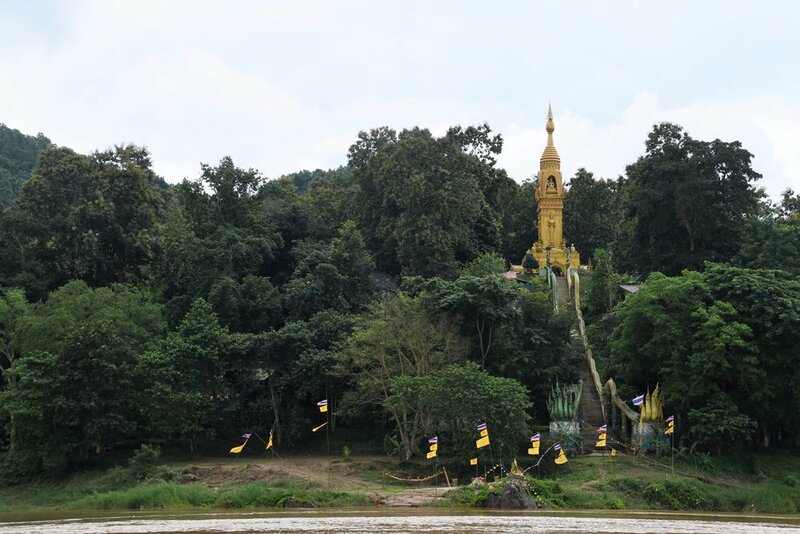 - This town 110% is only here to serve the longboats as they make their way to Luang Prabang. While bigger than we initially thought, it amazingly wasn’t much different than the trekking towns we experienced in Annapurna. Thankfully, lodging here was on our own so we ensured we had booked a night’s lodging in a decent spot & mapped out dinner at the Indian restaurant recommended nextdoor. Pro-tip: You certainly don’t have to book in advance if you enjoy bargaining onsite. Dozens of “salesmen” descend on the boat & offer you cheap rooms. - Apparently, thanks to the off season, we were the only boat in town & everyone was vying for our attention. I would never have guessed so small a town would have competing bars, but yes we were torn between Hive & Happy Bar. I won’t leave you in suspense - we chose Hive. - Imagine if you can a narrower boat, hull sitting shallower in the water (I was way too close to the waves for comfort) & our “van” seats weren’t bolted down. If we weren’t careful, we’d flip the whole set of seats! 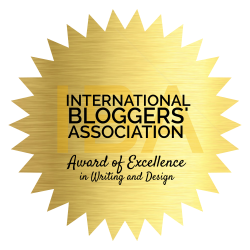 - This is where the blog pre-reads came in handy. One said to be sure you arrived plenty early to get a seat or you could end up in the engine room. The author was not kidding. After each seat was taken, they continued to board other travelers. Half a dozen or so poor guys ended up laying on the floor right next to the engine…for 7+ hours. They probably couldn’t hear for days! Pro-tip: Again this should be obvious from previous sentence - DO NOT be late! - Thankfully, the sun eventually appeared & what our transportation lacked in comfort & security, it made up for it in spectacular views. - Today, there were no other boats racing past, just us & the occasional groups of children playing along the shore. - We even got treated to some local elephants taking their afternoon dip! 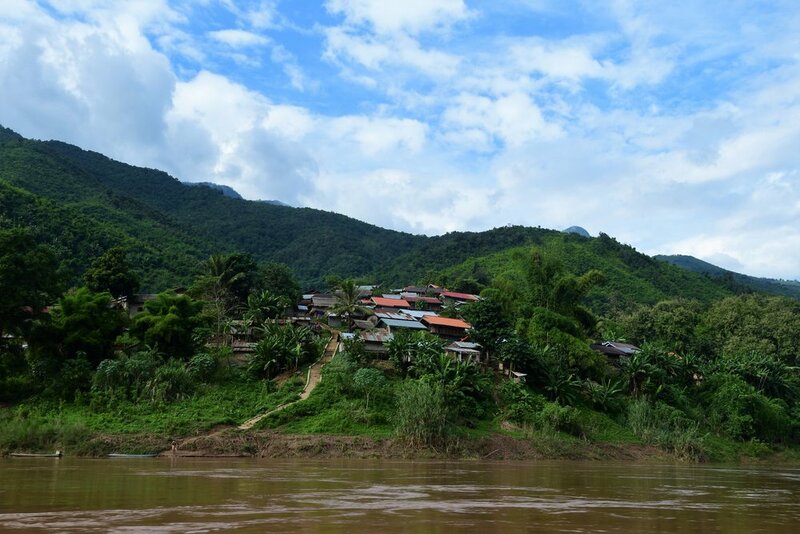 - Most of us could hardly believe it, few knew much, if anything, about Laos & we never realized just how gorgeous the countryside was! 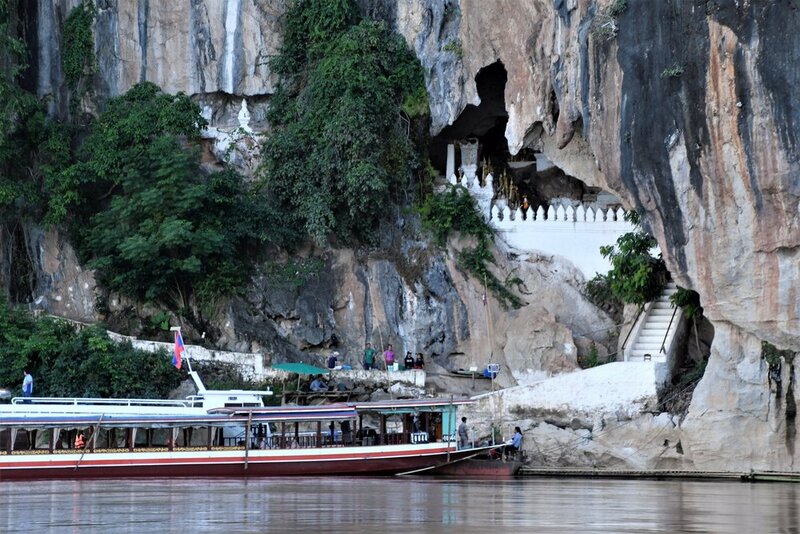 - Rounding a final bend, we sailed past Pak Ou the famous caves with some 4,000 Buddha icons inside. Just as I was questioning if this whole trip down the river had really been worth the long days, looking around me it was an easy answer. 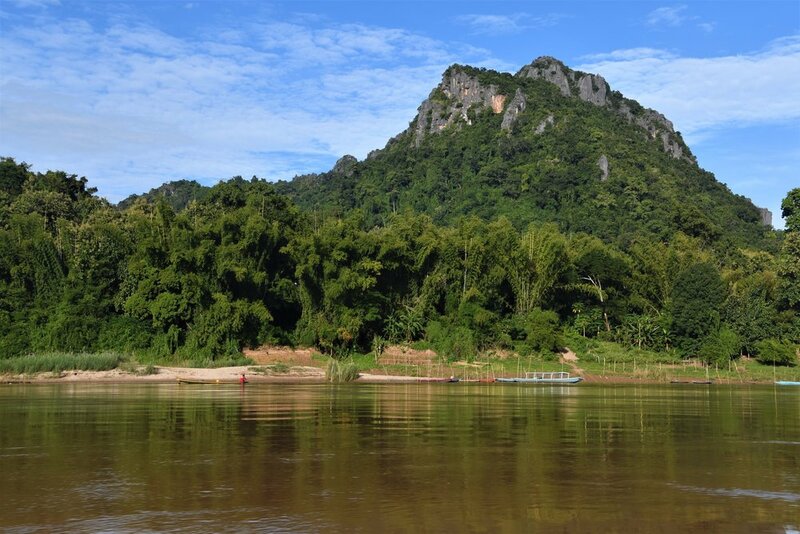 If we had passed & just taken the short flight to Luang Prabang, we never would have experience all the Mekong has to offer! It’s not a trip I would recommend lightly; you should definitely be prepared for long days, questionable seating arrangements & unpredictable weather - but it is so worth it!